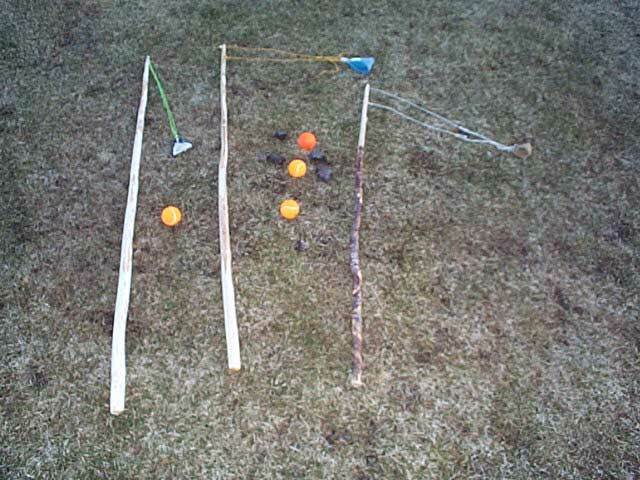 Photo: Three staff-slings, one regulation road-hockey ball (orange, 66 grams), three tennis balls (yellow, 57 grams) and miscellaneous chunks of asphalt. 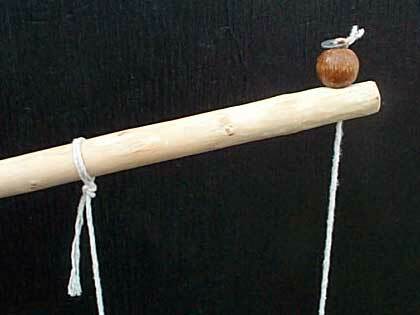 The first staff-slings I'd seen was at The Grey Company Trebuchet Page, where they call them "pole-slings". I've received a sort of commission to construct a trebuchet to hurl water balloons upon an enemy campment while avoiding a non-combatant camps in between. The main difficulty is that a suitably-sized treb (or any other siege engine, for that matter) would be too big to transport without a trailer or truck, which we don't have. I then determined that the best solution might be to fabricate a number of staff-slings to equip the whole crew. The advantages are numerous: cheap and easy to make, fairly easy to master with a bit of practise, easy to transport in a vehicle, and (best of all) easy to "RUN AWAY!" with. Background: There seems to be several versions of the staff-sling, or "fustibalus". One is a 3-4 foot staff with about a 3 foot sling. Another is a longer (5-9 foot) staff with a very short sling (about a foot or so). The short sling type was evidently favoured for maritime warfare because it wouldn't foul the rigging. Essentially, it's a trebuchet (or onager) arm and sling operated by hand. With regular sling ammo, sources say, a conventional hand sling gets better range than a staff-sling, but for heavier ammo (eg. hand grenades) the staff-sling is better. The Grey Company (see link below) used both a long staff (1.8m = approx. 71") and a long sling (0.8m = approx. 31.5"). They said it "most closely resembles the staff-slings in the Bible of Rhodes illustrations" and they were getting ranges of "50m with a tennis ball, 70-100m with a juggling ball, 120m+ with 200g stones". 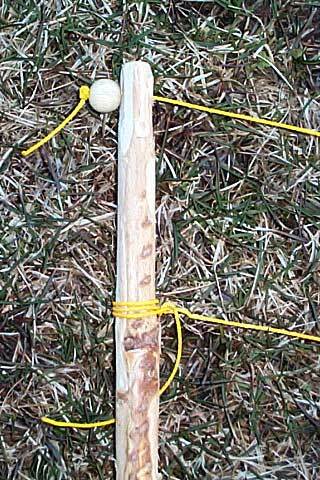 I made up a quick-and-dirty "proof of concept" staff-sling last night, with a 5 foot stick (piece of alder found on side of the road, had been used as a temporary guide marker for snowplow operators), a rounded diamond-shaped pouch of Indian smoke-tanned moosehide, and a 3-foot sling of twine. I cut a slot in the end of the staff and used a brass nut as the button on the release end of the sling. I practised indoors with a balled-up rag, then went out into the freezing rain to try it out in the parking lot. I think I got about 50m with a slush-ball on the first try, then went back in. It looks promising, since a slush ball must be about the same mass and density as a water balloon using those small balloons designed specifically for aquatic warfare. So, my question is: Has anybody tried various permutations of staff versus sling lengths, and which got the best range? Since our target(s) will probably be out of sight, I think range is more important than sniper-like accuracy. It'll be more of a weapon of terror. P.S. for Latin Scholars: What's the plural of "fustibalus"? Is it "fustibali"? I was trying to remember where I got the idea for using a slot and bead; and not a loop and hook or ring and pin release system. I'm pretty sure I didn't come up with it entirely on my own, but I can't find the source yet. I liked it because it seemed a lot safer to transport and use than a metal pin sticking out the end, and much easier to manufacture than carving a curved tip. If you mess it up, just cut it off and start over again  you've only sacrificed less than 2% of the overall length of the staff. Here's how it would look when ready to fire. As the sling swings around and over, the bead just slides off the end of the staff. 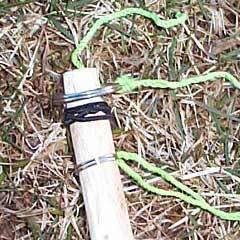 The fixed end of the sling is tied about 6 inches from the very tip of the staff. It was just a nice round number, so I really should try different distances, just to see if it helps or hinders range and/or accuracy. I flattened of the side of the tip a bit (about 1/16"?) where the bead rests, by running the last inch over an electric planer. It seemed like a good idea at the time, just to have a straight top edge for the bead. That little shiny bit on top of the bead is a small washer to keep the string from pulling through the bead hole. A final version will have heavier cord, and maybe a cool knot like a "monkey's paw" or something to keep it from pulling through. You don't want simply to tie the cord to itself after passing it through the bead and back around the outside. That would mean that the cord itself (forming a "Y") might be sliding along the slot edge, not the wooden bead, or that the knot might end up inside the slot. 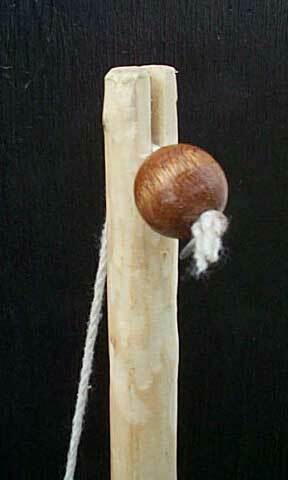 The wooden bead is 3/4" diameter. The slot is 3/4" deep, and about 1/8" thick. I used a bandsaw to cut it, but a handsaw would certainly work. Clamp the staff to something so that you can start the cut without risk of it slipping off the end and sawing your thumb off. Note the flattened side of the tip, where the bead slides along. If the sling consistently releases early (too high, straight up, or back) even after shortening the cords, I suppose it could be angled in to form a bit of a hook, somewhat like bending the pin on a trebuchet forward. I rounded the edges of the slot, first by running a small file along them, and then pulling a strip of sandpaper through it. I guess I was thinking that it would reduce the wear and tear on the cord, right at the spot where it comes out of the slot. I also rounded off the circular edge of the very tip, partly for appearance and partly to prevent splintering. I made two more staffs. The two on the left in the photo at the top of this page are 73 inches long, and the original 60 inch one is on the right. I found a knot the works as a stopper knot, so that I can eliminate the small washer used in the above photo. It's called a "Figure-Eight Sliding Stopper Knot" - http://www.beadandbutton.com/BNB/html/departments/basics/knots/200107_82.asp . I've just spent the evening at a local high-school football field, and got some puzzling results. Different staff lengths and different sling lengths all resulted in ranges around 45 - 55 yards, with a hockey ball and tennis balls as ammo. They tended to slice to the right, even the smooth-surfaced hockey ball. Small chunks of asphalt pavement (half the size of my fist) went about 50-60 yards, but flew straighter. Even different release systems (photos below) gave similar results. 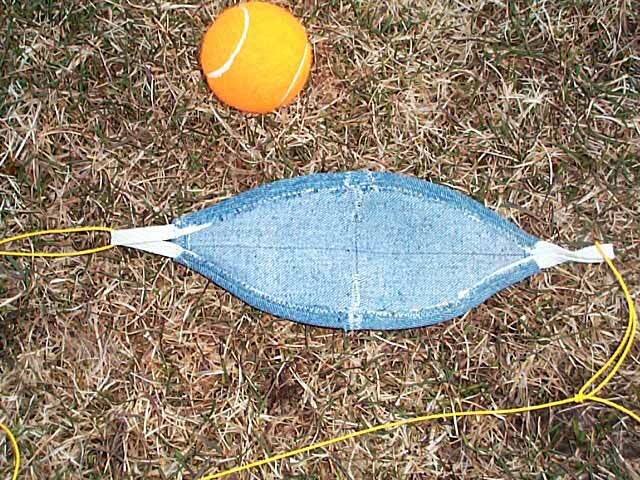 My early experiments with slush balls (more mass) were getting ranges around 55 -60 yards. Bead with "Figure-Eight Sliding Stopper Knot". Borrowed sling from trebuchet Hotspur. The small split keyring just happened to fit snugly, The black hair band/elastic thingy was there just to keep the large split keyring from sliding too far down the staff. It was the first thing I found in my pocket, it worked. I'm starting to think that a simple bowline on the loose end of the sling, slipped over the tip might be good enough for a release. Pouch made from the legs of some Levi 691 jeans, with a skate lace sewn in for reinforcement and loops to attach sling cords. Some good news though. I found that my paces are pretty accurate. I paced off a regulation Canadian football field (110 yards), and I counted 109.5 paces. Handy for rough measurements of ranges. Some further trials conducted today yielded ranges on the order of 60 yards. My best shot was about 72 yards (over a neighbouring building) and Lord Jonathan O'Rose tossed one over the building and a parked schoolbus, landing about 92 yards away. His technique involved much less initial movement of the right arm, keeping the right hand (the fulcrum) closer to the shoulder and neck, so that it was more of a first-class lever (like a trebuchet) than a third-class lever. The right arm extends later on the follow-through. It also went much straighter. Safety Warning! It turns out that the wooden bead with a stopper knot or nut is not strong enough for hurling rocks. It is liable to split the bead, or simply pull through, resulting in a wild throw that may come straight back down or hit a bystander. I'm starting to think that a metal ring would be safer than the bead, since you would not have the twine sliding across the wood inside the slot on the end of the staff, causing premature wear of the twine.